Fork tines are supplied in a range of capacities and lengths. 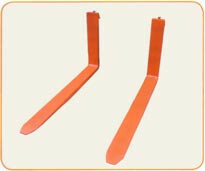 Always ensure that the rating of the fork tines is equal to or greater than the rated lift capacity of the fork truck. Note: The fitting of fork tines with a lower rating than the fork truck could lead to failure resulting in serious injury or death. When fitting fork tines, ensure that the marking on the fork tine is compatible with the fork truck rating. Each tine is stamped on the side with the relevant information. The rating is for an individual fork tine and should be doubled to provide a total safe working load. Refer to the table above for ratings.